Quick question – Does every “big space movie” necessarily have to be a referendum on how an artist feels about 2001: A Space Odyssey? It’s entirely possible that the answer is “yes.” Whether it’s fair or not, Stanley Kubrick’s game-changing 1968 film has provided the basis of comparison for a vast number of science fiction films made in its wake. This includes Solaris (1972), Close Encounters of the Third Kind, Star Wars, Alien, the Star Trek films, and more recent fare such as Contact, Event Horizon, Sunshine, and Moon among many others. In Interstellar, blight has destroyed many of the world’s staple crops and time appears to be running out for humanity on Earth. A former test-pilot-turned-corn-farmer (Matthew McConaughey) and his precocious daughter Murph stumble upon NASA’s Area 51-esque hidden base. With more pressing Earthly matters at hand, NASA has become disreputable and is forced to operate underground. To establish a new home and save humanity, they are planning a mission to enter a worm hole near Saturn that will take them to a few suitor planets in another galaxy. In this Luke Skywalkery scenario, McConaughey’s Cooper turns out to be just the man to pilot the mission. While the astronauts (Anne Hathaway among them) scope out promising habitats, the possibility that a father may not be able to keep his promise to return home for his daughter looms. The manipulation of three-dimensional space by fifth-dimensional beings (or something like that) ensues. Though a scientist’s fear of time may be at Interstellar‘s core, director Chrisopher Nolan manages to make time into his little plaything in a way few modern films dare to do. Unafraid to let the story jump from scene to scene without using banal montages or title cards, Nolan manages to evoke some of cinema’s more ponderous classics. Montages of people driving or otherwise preparing for what is to come have become one of the most abused and ubiquitous devices in film. Outside of Edgar Wright (Shaun of the Dead), no directors seem to do anything interesting with them. Nolan sidesteps the issue almost entirely by not spoon feeding every moment and letting us fill in the time gaps ourselves. Nolan has played with time before in Inception (2010) and even Memento (2001) but not quite to the extent he does with Interstellar. 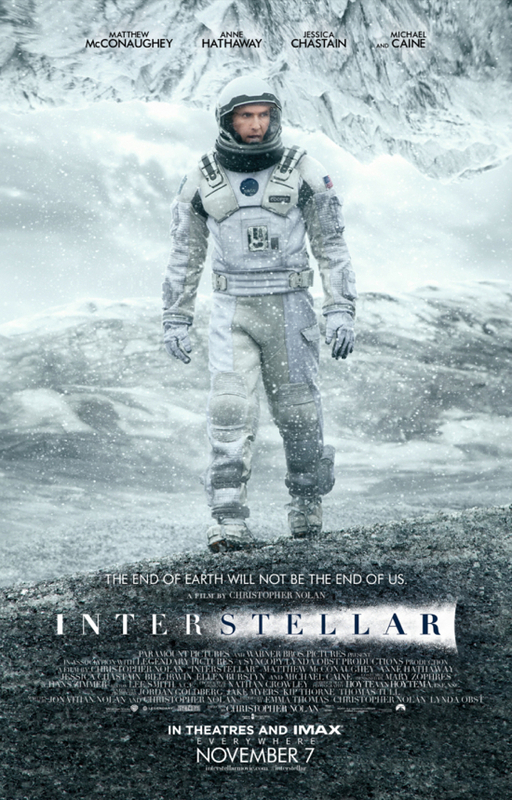 This lends a dreamlike quality to Interstellar that sets it apart from most mainstream films made today. Similar to 2001, Interstellar should be commended for delivering a strong sense of wonder. I love wonder. In fact, I’ve written about it in this space several times before. Interstellar brings the wonder through both the non-cynical tone it strikes and the cinematic purity of its technical ambition. This wonder and the aforementioned dreaminess are results of Nolan’s devotion to very serious old-school filmmaking. Devotion to practical effects is not exactly in vogue these days. In the age of computer generated imagery, there really is something to be said for seeing objects on screen that were actually there in front of the camera in real life. The space sets and the cinematography are, unsurprisingly, incredible. The estimated budget for Interstellar is listed at $165 million on IMDb and, with a run time of 169 minutes, it really feels like the entire budget is up there on the screen. Nolan’s technical chops have always been impressive and he is to be commended for his efforts with Interstellar, even if the drama isn’t always on par with the effects (we’ll get to that). On a personal note, Nolan’s continued use of Kodak products makes me proud all over again to be a Rochester, N.Y., native. Kodak is no longer the lifeblood of my home town, but the fact that a very famous Englishman still thinks it’s an important company might be more significant to me than anything in the film itself. A scientist named Kip Thorne was consulted in the making of this film. I’m glad that the production went the extra mile in creating a plausible story (at least for laymen) featuring worm holes and, for my taste, all of the sciencey stuff was explained to a satisfactory degree (even if that meant borrowing directly from Event Horizon). I may not be able to tell what holds water in the astrophysics community but, I’m pretty sure none of it matters when discussing Interstellar. This movie was a great ride that was really more about imagination than hard science. Nolan deserves any praise he gets for his skilled creation of spectacle. On the flip side, when he dismounts from his high-wire routines, bringing the story full-circle in dramatic terms, he doesn’t always stick the landing. The middle segment of Interstellar is a prime example. This portion is emotionally resonant, thrilling and even features a surprise guest appearance by a very famous actor. And yet, it feels extraneous. With an already excessive run time, the film would probably be better off without a sequence that ultimately serves to set up a joke about how the nature of man may be evil. It’s a sequence that works well on its own terms and yet strikes an odd discord within the rest of an otherwise optimistic film. The relativity-tinged scenes depicting the tragedy of passing time are appropriately devastating. It’s some of the other gooey moments in which the man behind the curtain accidentally reveals himself. Dr. Brand (Hathaway) tries explaining how love (and gravity) are the only forces that can transcend dimension (I have to wonder if Alfonso Cuaron beat Nolan to the punch by titling his latest movie Gravity). While this may be exactly the kind of thing someone like Dr. Brand would say, it still feels like a shoehorn. I may not be able to comprehend exactly how gravity transcends dimension, but I do know that love isn’t anything like gravity. This is precisely the kind of reach that Kubrick never had to make. 2001, dialogue-free for most of its run time, lets the imagery speak for itself. I’m neither a father nor a daughter and yet I teared up on several occasions, relating all too easily to the central relationship in the movie. Interstellar is filled with powerful and moving moments, but somehow, being suspicious of the tears as they stream slightly diminishes the experience. If Interstellar falls short of 2001 in any obvious way, it is that. Both films take you on a profound journey, but in 2001, the emotional takeaway doesn’t feel manufactured. Now I’ve gone and done it. I’ve compared Interstellar to 2001. Shame on me, because I actually like Interstellar a lot. Chris Nolan has been making really good movies since the late Nineties and Interstellar is no slouch among them. Nolan is clearly a talented artist. He’s mastered time and gravity and other themes in his films, so I guess I can give him a pass for struggling a bit with love. I’m going to enjoy revisiting and puzzling over Nolan’s latest opus, even if he hasn’t quite mastered the fifth dimension yet.